Eating an extremely limited-calorie diet won’t make you live longer. Maybe. 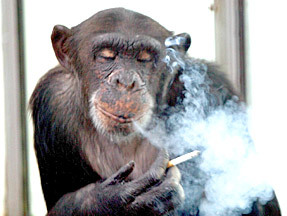 yeah, yeah, i know a chimp is not a monkey. Don’t be such a Mr. Pants. The sad part is that the study was done on a bunch of monkeys. Pack of monkeys? Six-pack? Gaggle of monkeys? All I know for sure is Flock of Seagulls, but then I have hair flashbacks so I try not to go there. Basically, for 25 years scientists took some rhesus monkeys (not to be confused with Reese’s monkeys, who exist only on chocolate and peanut butter) and semi-starved them. nyt says they were the equivalent of a 6-foot-tall man who weighs 120 to 133 pounds. So basically, an Olympic marathoner without having to run all those pesky miles. The theory was they would live longer, and this would be applicable to humans as well. Basically, they’ve been starving these guys since 1987. How many Medium Chocolate Frosties does that work out to? Where the heck IS Jenster when you need her? Alas, says Gina Kolata (yes, I just enjoy saying Gina Kolata) the monkeys didn’t live longer, they just got bitchier. I may have made that second part up. Come to think of it, I may have made up the name “Gina Kolata,” just so I could enjoy saying it. Cancer and heart disease were the same. Buy that monkey a banana split asap. The story goes on to say a lot of other stuff, but that would require reading past the third paragraph, a strict violation of Internet Protocol. The takeaway: Just worry about running. Extreme eating habits, not so much. Next time you see a monkey, apologize profusely. And maybe buy him a Frosty. This entry was posted in running and tagged life, mother teresa chacha, roscoe the talking magpie. Bookmark the permalink. damn, i wish i had gone to Math Camp.